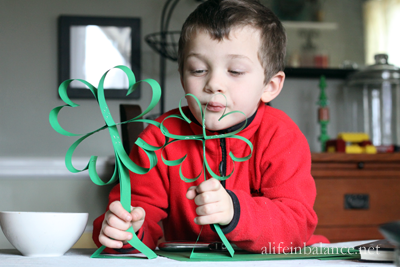 This St. Patrick’s Day Paper Shamrock is an easy paper craft, perfect for preschool and up. You can make it with or without the stem. 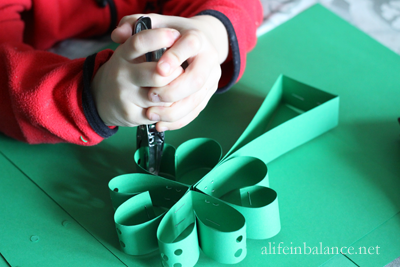 Link the shamrocks together if you decide to skip the stem and make a St. Patrick’s Day garland. Normally, I don’t go in much for St. Patrick’s Day decorations, despite being Irish…..and English and Cuban. After Valentine’s Day, I’m content to keep things generally simple while getting ready for Easter. After all, it is Lent. This year, I wanted to do a little more with and for the kids. They love doing crafts, and I love to encourage their creativity. 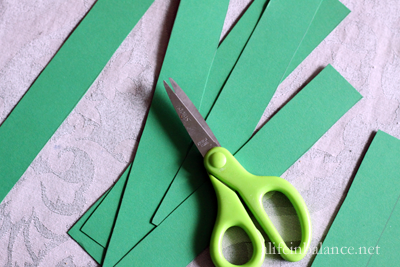 I found these cute St. Patrick’s Day paper shamrock via Meaningful Mama on Pinterest, and decided to try it out. After all, paper crafts are usually easy to set up, and generally not too messy. 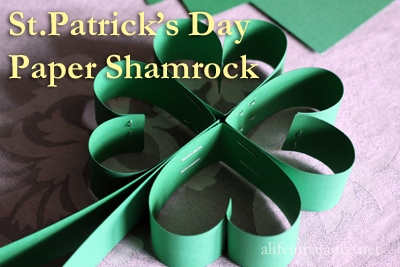 Check my St. Patrick’s Day Pinterest board for more crafty inspiration. 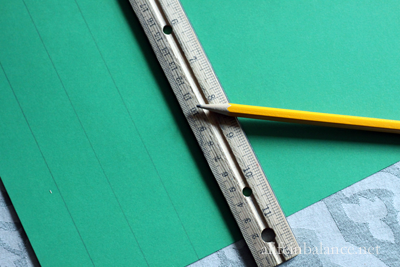 Using a ruler, I drew lines for the strips on green cardstock. Each shamrock needs 4 strips for the shamrock and 2 strips for the stem. While you can make strips the width of the paper, I found strips made using the length of the paper easier to work with later on. Cut up your strips. If you’re a little Type A like me, you can do the cutting, or you can hand the scissors to a child. Just make sure the scissors are sharp since you’re working with cardstock. After the strips are cut, see if your kids want to decorate them with hole punches, markers, or crayons. 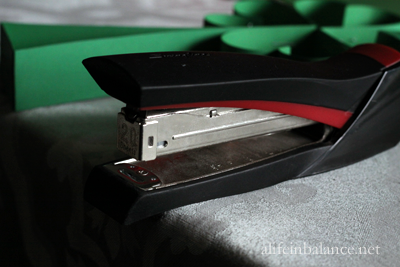 When stapling the shamrock, I found it easier to set the stapler at the edge of the table and press down. I could dangle the shamrock part next to the table without squishing it. Bend each strip in half and firmly crease the fold. Form each folded strip into a heart shape and staple together. This is where you’ll find it easier to work with the longer strips. Staple each heart shape in a shamrock pattern. I used 2 staples to attach each one. The stem is inserted between the last 2 heart shapes which you’ll see in the picture below. 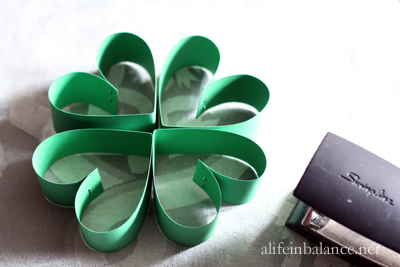 If you need to, you can decorate the shamrock after it’s assembled. The shamrock on the left is made of vertically-cut strips of paper; the one on the right is made from horizontally-cut strips of paper. I love this craft! My son can use the practice with scissors too so it’s a win-win! thanks! Cool! My son had a lot of fun hole punching the leaves on the shamrock.